Our Fast Track Service speeds your order through our production process. Your order will be despatched within 1-3 working days of order payment or on approval of your artwork. This is subject to stock availability and the size of your order. If you specify a delivery date we will dispatch your order by your chosen method and by the dispatch date requested. You will be advised if this cannot be achieved. We will not accept responsibility for goods delayed by your selected delivery service. We recommend that you select the tracked delivery service or carrier for all fast track orders. We offer discounts on a wide range of products. All discounts are clearly shown and will be automatically added at the basket page. Our engraving craftsmen are trained to the highest standards in the UK using the very latest computer controlled engraving machines - including laser and glass - as well as sublimation, chemical etching, anodic print and wide format digital print operations. Very good products, well made, quality material and super efficient to deliver. A low cost alternative to screen printing. Our aluminium dye sub industrial identification plates can incorporate spot or full colour graphics as well as photographic images. The ink is printed into the metal surface leaving a durable print that cannot pick off or peel away, a clear advantage to screen printing. Ideally suited to interior use these labels may also be sited externally but will have a lifespan dependent on the conditions they may face. Measuring 50mm x 50mm x 0.5mm and supplied with bur-free straight edges, the aluminium is available in numerous finishes, ranging from white to brushed or satin silver. Self-adhesive backing, holes for screw/pop rivets and rounded corners can all be added during the ordering process. New customers - please upload your image/text details where requested. Artwork will then be sent via email for your approval. NB. Small quantity orders (less than 10) may incur extended lead times or a minimum order charge - if relevant we will contact you to discuss. Unsure of going ahead with your main order? Why not check out one of our sample packs first here. 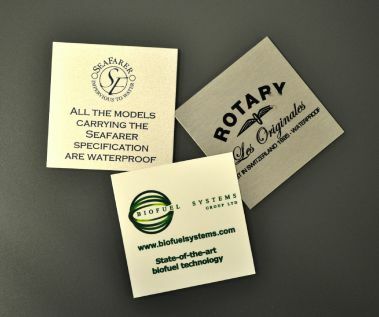 Aluminium Dye Sub ID Labels can be supplied with 2 or 4 x 3mm fixing holes, self-adhesive or without any fixings. We endeavour to dispatch all orders within 3 to 5 working days of placing your order or on approval of your artwork. If selecting our Fast track service, we aim to dispatch your order within 1-3 workings days. If you are a returning customer and you wish to use artwork we have previously produced, please click here to login. Acceptable files are either jpg, bmp, gif, png, eps, doc, docx, xls, xlsx or pdf format. Artwork will be sent to you for approval by email. We will not start your order until authorization is received. STEP 6 - Would you like to see a proof prior to production? Would you like to receive a proof? Your item will be professionally designed based on the information given; if you would like to request a proof before we produce your order, please specify here. Note upon receipt of your completed order, you will receive email notification that the artwork is viewable within 48 hrs. This artwork can be amended as often as required until you are satisfied with the result. We will not start your order until authorization is received. Please enter any additional comments or special requirements you may have for the item above. If you require your order for a specific date, please enter it here, fast track charges may apply. The quantity you have entered does not meet the minimum requirement. Copyright © Brunel Engraving Company Ltd. All rights reserved.